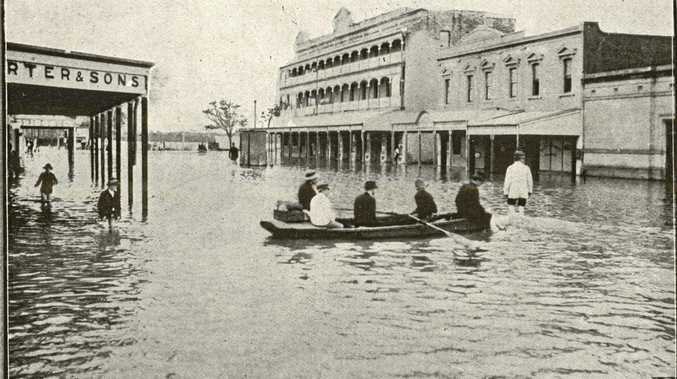 Rockhampton flood of 1918 people in boat on East Street and William Street intersection. YESTERDAY the weather in Rockhampton was for the most part fine. The rainfall for the 24 hours ended at 9am was 2.04 inches, making a total for the 96 hours of 23.82 inches, an average of nearly 6 inches daily. The Fitzroy River at Rockhampton, according to the observations of the police flood warning officer, Acting Sergeant Smith, reached a height of 29 feet 2 inches above low-water level of ordinary spring tides; but information obtained at the office of the Harbour Board places the level at 29 feet 4 inches. The water remained stationary for 10 or 11 hours, and began to recede at 10 o'clock on Wednesday night. It also continued to go down very slowly yesterday, falling 1 foot 2 inches by five o'clock in the evening. The stream will, it is expected, continue to run down very appreciably for some days; but it is well to remember that there is still a large quantity of floodwater to come down from the tributaries of the Fitzroy. Both the Dawson and Comet rivers were high yesterday - the former at 9 o'clock in the morning, being 49 feet above summer level and rising at the rate of 4 inches an hour, and the latter 59 feet 6 inches above its accustomed mark and making at the rate of 1 inches per hour. AS ON Wednesday, reports were again current yesterday of cases of drowning. The only case, however, of which the police had information was one that occurred near the railway line, between Kent and West streets, in the morning, the victim being a railway carpenter named Walter Wakeham, aged 43 years. Wakeham and his wife lived in a house at the corner of West and Caroline streets, but quitted it about midday on Tuesday owing to the flood and went to the residence of Mrs. Wellings. Wakeham left Mrs. Willing's house at 6 o'clock yesterday morning with some clothes, and sometime later he was seen in a few feet of water and presently to disappear. Two young men named Leonard Cowan and Sydney Peake immediately went to his aid, brought him to the surface, and placed him in a boat. Without delay, they resorted to artificial respiration, Cowan understanding the method thoroughly. The Ambulance Brigade was also summoned. The bearers tried for half an hour to restore animation, continuing their efforts until Dr. Dean arrived on the scene and pronounced life extinct. The bearers removed the body to the General Hospital, the Government morgue being flooded. On Tuesday afternoon, a pumper named Farley, in the employ of the Railway Department, is stated to have left the railway pumping station at the Serpentine Lagoon in consequence of the flood and no trace of him has been obtained. A diligent search has been made for him, a boat being out at the pumping station on Wednesday afternoon, when there was about 3 feet 6 inches of water on the railway. Mr. J. W. Kidd, Acting Divisional Mechanical Engineer, with Messrs.
Bell and Adams; two other railway men, left again yesterday morning in search of the missing man, but without getting any news of him. Some uneasiness is felt for the safety of people on Casuarina Island and for Mr. O'Connor and Miss O'Connor, Scrubby Creek, and Mr. Watkin, in the same locality, who were last seen on Tuesday evening. A SURVEY of the situation was made by the Mayor, Alderman T. W. Kingel, in a motor boat across the flooded area from the lower end of East Street to the Port Curtis Junction yesterday. What surprised him most was to still see people in their houses, which in some cases were surrounded by water 5 feet or 7 feet deep, with a current running very strongly. The Mayor thinks it very unwise for them to remain in their homes. There is a danger, he says, of the supports of the buildings giving way at any moment and of the premises being precipitated into the water - perhaps at a time when there is no one at hand to lend assistance. He strongly urges the occupants to leave. Plenty of accommodation can be found for them in the town, and there, at any rate, they will run no risk of losing their lives and the lives of their families by drowning. The Mayor requests us to point out that it will be highly undesirable for people who have had to leave their houses in the flooded areas to return there, as many have already expressed their intention of doing. He has made careful inquiries into the position of affairs and is confident that the river which is now falling, will begin to rise again about Monday next, possibly attaining again to the recent high level. He has made arrangements for full information as to the movements of the waters in the river's tributaries and will give official notice at the earliest moment of the passing of all danger. He thinks it will be a pity for people who have moved into town to leave it until they can do so with a surety that they will not have to come back to it in, perhaps, a few days. Only meagre reports were to hand yesterday of losses of livestock. It is known, however, that they have been very serious, large numbers of cattle, horses, pigs, goats, and fowls having been washed downstream, either dead or alive. Mrs. Payne, West Rockhampton, lost pigs of the value of about 300 pounds. Mr C.A. Davis, an employee of Messrs. Denham Brothers, who resides in West Street between Denham and Fitzroy streets, was also a sufferer. He had the misfortune to lose 35 out of his herd of 39 mixed cattle by drowning. THE Rockhampton Botanical Gardens suffered considerable damage as the result of the heavy rain and wind. Several Jacaranda trees in various parts of the gardens, which had stood the test for 26 years, were destroyed, as well as one in front of the residence of the Curator, Mr. R. Simmons, another in front of the kiosk, and four on the flat above the old kiosk. Fortunately, they fell on vacant ground. Two large bunya pine trees in the drive and a fine hoop pine tree, one of a clump near the kiosk, were also lost. Many other trees, large and small, were more or less seriously damaged, the branches covering all parts of the gardens. ... Mr. Simmons has had experience of floods at the gardens since 1886. The present flood, he says, was 3 feet higher than the previous highest, which was in 1896, and it extended about a chain into the lower portion of the gardens. It will be a few weeks or more before the gardens are restored to anything like their former state. The Mayor yesterday received the following telegram from the Acting Premier, the Hon, J.M. Hunter: "Kindly convey my sympathy, and also that of the Queensland Government, to the citizens of Rockhampton and district in connection with the distress caused by the present floods. "I trust that steps are being taken to alleviate the distress as much as possible.